When the Flying V’s original patent appeared in 1957 alongside the Futura/Explorer and Moderne, it might have been argued that Ted McCarty’s heady 50s sci-fi-style brainstorming sessions in the Gibson boardroom were pitching a little too far out into the modernist field. As it transpired, these guitars were way ahead of their time and took many years to catch on; indeed, the Flying V stuttered, stalled and got off to a few false starts before it really began to fly. As Fender’s Stratocaster and Telecaster models consistently captured the guitar-buying public’s imagination by embodying the modernist design principle ‘form follows function’, the Flying V’s function appeared to follow its form, as it eventually took off and found its wings as an archetypal hard rock statement guitar. The joys of the Flying V were not always immediately obvious, however, as Mike explains: “It was a very unpopular guitar for Gibson. They made about 100 of the original gold-plated hardware korina [African limba wood] Flying Vs between 1958 and 1959, and they’re extremely rare - and desirable - these days. As the Flying V’s popularity grew, so, too, did the demand for rare, original examples from the earlier periods of production. 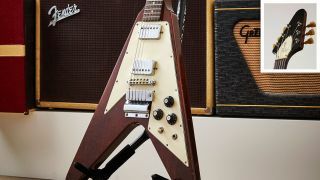 Subsequently, the prices of original 1950s Flying Vs now reach well into the six-figure range, while this 1969 Flying V recently sold for £30,000. Although this Flying V reached final assembly in 1969, it appears to have begun life at the Gibson factory years earlier. The vast majority of late-60s Flying Vs share identical pickguards and electronic components, with pots dating to 1966, regardless of shipping year, indicating that they were all allocated parts at the same time for later assembly. “It appears Gibson did all of the electronics assembly in one go, back in 1966, for the entire five batches,” explains Mike. “It’s likely the pickguards were all put together at the same time - certainly, the parts were sourced at the same time, because they’ve all got ’66 pots, identical pickguards, and pre-‘T-Top’ pickups [‘TTop’ humbuckers appeared in the mid-60s]. “Although the pickguards were assembled in 1966,” Mike continues, “they were most likely wired together at a later date when they finished the guitar off, because the only difference in the electronics between batches appears to be the wiring - it’s often coloured differently throughout the years. Previous batches have multi-coloured wiring [there are combinations of green, yellow, black, white, grey and plain wires], but the wiring in batch-five Flying Vs from 1969 tends to be the same colour: yellow. However, this one does have multi-coloured wiring, so it was probably wired up soon after batch four in 1968, or very early on in ’69. The pre-‘T-Top’ humbuckers retained in this 1969 Flying V are a particularly desirable feature and, according to Mike, “these are original patent number sticker [“PATENT NO 2,737,842”] humbuckers from the mid-60s. They’re similar to PAF pickups, but they’re wound with an auto-stop machine and they have slightly different wiring. They’re some of the last of the really, really nice-sounding pickups of the 60s era. Unlike a majority of Gibson’s doublehumbucker guitars, the early Flying Vs featured three pots/knobs, as opposed to four. “There are two independent volume controls and one master tone control,” explains Mike. “All three pots are 500k[ohms] CTS brand, dated to ’66 [prefixed 13766]. In fact, all the late-60s Flying Vs I’ve seen have 1966 pot codes - and the tone capacitor is a 0.022uF ceramic disc type. The pickup selector switch and the output jack are both Switchcraft brand, but I think they often had problems fitting the socket, because Flying Vs have a very thin body. “As is the case with this guitar, you often see the shielding paint has been filed away around the socket, and when they finally assembled them, they sometimes found it was a bit difficult to get the tip of the jack all the way in, so on some of them you can see they’ve increased the space of the routing by hand to accommodate it. “The knobs are often called ‘witch hat’ knobs because of their appearance,” Mike explains. “Although they’re not the most popular style of knobs these days, I think they go really well with the angular styling of the Flying V. Before they brought in the witch hat knobs in 1967, they were using ‘reflector’ knobs [with metal ‘tone’ and ‘volume’ caps]; the first few batches of late-60s Flying Vs mainly had reflector knobs, but they moved over to the witch hat knobs for the last couple of batches. “The last batch of walnut Flying Vs from ’69 are the most desirable of the five batches because the neck profile is fairly chunky. It’s like a ’68 Gibson profile - it has a bit of meat on it, whereas the others, in batches one to four, tend to be a bit on the skinny side. A lot of the famous V players tended to use instruments from the fifth batch - people like Marc Bolan, Leslie West and Mick Ralphs. Jimi Hendrix also used late-60s Flying Vs from the earlier batches. “The batch number is buried in the serial number, but more than anything they’re identifiable by their features. Distinctly, all batch fives have a walnut finish and a three-piece neck. The three-piece neck is something that appeared in 1969 after Norlin took over Gibson production; they started to look for ways to economise and one of the things they did was to introduce the three-piece neck because it required thinner pieces of mahogany to make. It’s made with Honduran mahogany and is constructed using a thick centrepiece, with two pieces glued on either side, and that extends from the tip of the headstock to the end of the neck tenon. The vast majority of late-60s Flying V pickups are pre-‘T‑Top’ patent number sticker humbuckers, although the occasional PAF has been known to put in a rare appearance! Another distinctive feature of the late-60s Vs is their chrome-plated body hardware. “The late-60s Flying Vs had the shorter version of the Gibson vibrola,” says Mike. “Although it didn’t have a plush ‘leaf and lyre’ Gibson logo engraved cover like the longer one, it did the same job. Those units can really hold their own. “Obviously, you can’t dive-bomb with them, but they’re pretty stable. The Tune-o-matic bridge is also chrome-plated and has nylon saddles. Any 60s Flying V you come across should have nylon saddles - they were all manufactured in that period [1961 to 1971]. 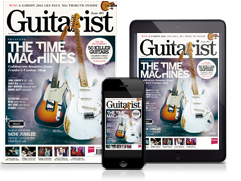 “Unlike the vibrola and Tune-o-matic bridge, however, the tuners are not chrome-plated. They were made by Kluson and were always nickel-plated. The tuners on this Flying V are Kluson Deluxe branded, but they changed later in ’69 to Gibson Deluxe. They’re almost identical. It’s very difficult to spot any difference at all, but if you look really closely, you’ll see ‘Gibson’ rather than ‘Kluson’ branded on the back. “It’s a completely unique guitar and is all original, which is unusual for a Flying V, as many Flying Vs have had mods done to them over the years. Most commonly, it’s Grover tuner replacements and added pickup surrounds, but the cardinal sin of all Flying V mods is adding a stop tailpiece. That is one of the worst things you can do to them. A lot of these poor things have had all sorts of mods done to them and it’s rare to come across one that has survived intact. Thankfully, this one’s a survivor.